While most of us buy our trucks because they are a necessary and useful piece of equipment, we also want them to look great. Without having to deal with crazy modifications or really expensive paint, how do we make our trucks look awesome? 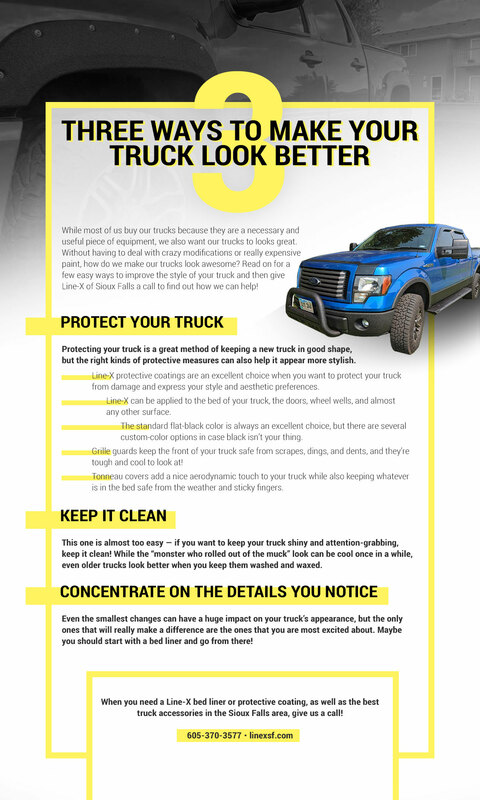 Read on for a few easy ways to improve the style of your truck and then give Line-X of Sioux Falls a call to find out how we can help! At Line-X of Sioux Falls, we offer the best protective coatings in the world — Line-X. Line-X has, time and time again, proven to be the most effective method of protecting the bed of your truck, as well as almost every other surface on your vehicle, from damage caused by the sun, chemicals, scrapes, and almost any other type of destruction and deterioration that could befall your pickup. In addition to offering the world’s best protective coatings installed by highly skilled, experienced, and well-trained technicians, we also stock and install a wide range of truck accessories that defend your vehicle from catastrophes while injecting it with a dose of your own personal taste. Call us now to find out how we can take any truck from bland to BAM! Protecting your truck from future damage is a great method of keeping new and older trucks in good shape. While thinking about prevention is important for keeping your vehicle on the road, the right kinds of protective measures can also help it appear more stylish! Line-X protective coatings are an excellent choice when you want to protect your truck from damage while expressing your style and aesthetic preferences. Line-X is so versatile that it can be applied to the bed of your truck, the doors, wheel wells, bumpers, and almost any other surface. The standard flat-black color is always an excellent choice, but there are several custom-color options in case black isn’t your thing. Grille guards keep the front of your truck safe from scrapes, dings, and dents. They’re also tough and cool to look at! We stock a number of grille guards in different styles. Some of them have extra features, including light bars and winches! Tonneau covers add a nice aerodynamic touch to your truck while also keeping whatever is in the bed safe from the weather and sticky fingers. At Line-X of Sioux Falls, we can install a tonneau cover on your truck that offers the security you need without sacrificing your vehicle’s appearance. Contact us today to learn about our soft- and hard-shell tonneau covers. This one is almost too easy — if you want to keep your truck shiny and attention-grabbing, keep it clean! While the “monster who rolled out of the muck” look can be cool once in a while, even older trucks look better when you keep them washed and waxed. If you leave your truck dirty, you’re just asking for damage. Roads are covered with contaminants that can build up on your vehicle and ruin the paint and metal components of your truck. Salt, mag chloride, tar, and oil can be found in large amounts on almost every road over the course of a year. If you don’t clean that stuff off, a brand new truck can start to look old, dull, and beat up within a few years. If you don’t like washing your truck, Line-X protective coatings might serve two helpful purposes: first, as a way to stop your paint from getting scratched, and second, as a less maintenance-intensive alternative to traditional paint care. Concentrate On The Details You Notice! 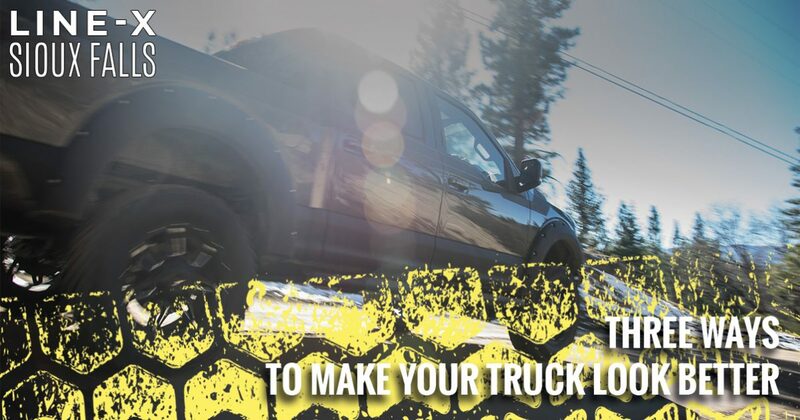 Even the smallest changes can have a huge impact on your truck’s appearance, but the only ones that will really make a difference are the ones that you are most excited about. Sometimes, a Line-X bed liner is all it takes for you to love looking at your truck again. Maybe you simply need to change your badges or install a grille guard to put a smile on your face every morning. Give the truck experts at Line-X of Sioux Falls a call today to see how we can help. When you need a Line-X bed liner or protective coating, as well as the best truck accessories in the Sioux Falls area, give us a call! We are always ready to help you turn your truck into a cool custom vehicle that you will love to look at!